Pattern recognition is a buzzword in the realm of artificial intelligence. It underpins the ability to form assumptions based on observations and prior knowledge. In the race to develop robotic intelligence, we must find a way to emulate the human aptitude for pattern recognition. You need look no further than a young child learning to distinguish a cat from a dog, to see how well adapted the human mind is for pattern recognition. From a very early age, we make associations that build our ability to make accurate predictions. This is fundamental to the processes of learning and decision making. Doctors apply the same principles when making disease diagnoses; they recognise the symptoms that match up with a known disease. Often, the initial match is only partial, so pattern recognition is fundamental for ‘filling in the gaps’. Interestingly, a neuroimaging study has suggested that the neuronal systems used for generating diagnostic hypotheses are in fact the same as those used for naming animals. Recognition of a particular pattern is learned; it comes from experience. This means that doctors from different specialties (or with different levels of expertise) look for different features, and are more likely to identify diseases that they are more familiar with. Initial diagnoses are subjective (and sometimes speculative) because doctors are trying to recognise patterns where they only have partial information. It’s the same when understanding behaviour. Without considering all the possibilities, using all the behavioural sciences, how do you make sure you have the ‘right’ outcome? And can you still develop the best possible intervention to change your audience’s behaviour? At Hamell, our mission is to change behaviour for good, and by ‘good’ we mean sustainable changes that lead to better health outcomes. To do this, we consider all the angles. Much like pattern recognition, behavioural psychology argues that an individual’s behaviour results from learnt associations between stimuli and outcomes. Using the principles of behavioural psychology, we investigate the relative influence of past experiences and cues in our environment. Our approach is strongly influenced by the concepts of ‘behavioural design’, and we strive to uncover the mental shortcuts used when making everyday decisions. We work with leading academics to develop the best evidence based solutions for our clients. Illness cognition describes the personal health beliefs that underlie our attention, interpretation and consequent behaviours in response to health care information. Always mindful to apply leading academic knowledge in practice, we work with experts to critically evaluate the feasibility of behaviour change approaches and to identify what, when or where each would be most effective. Acknowledging the value of culturally appropriate care, we delve deep into health behaviour fields that are often overlooked. We obtain a richness of understanding only achievable through using approaches such as ethnography, and the study of social interactions and perceptions within groups. Only Hamell sees the whole picture. 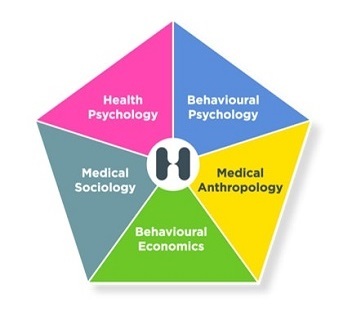 Hamell continually develop our 360 degree behavioural analysis model, working with academics at the forefront of research and learning from multi-disciplinary approaches. We use this model to design effective behaviour change initiatives and engaging creative solutions for our clients. We aim to change behaviour for good, and for the better. For more information about our approach and to see what we could do for you, contact fiona@hamell.co.uk or visit the Hamell website.